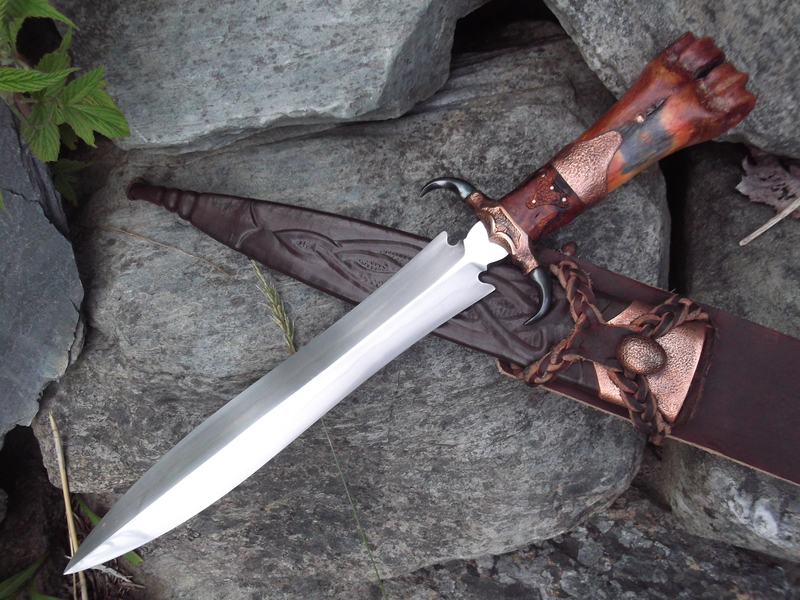 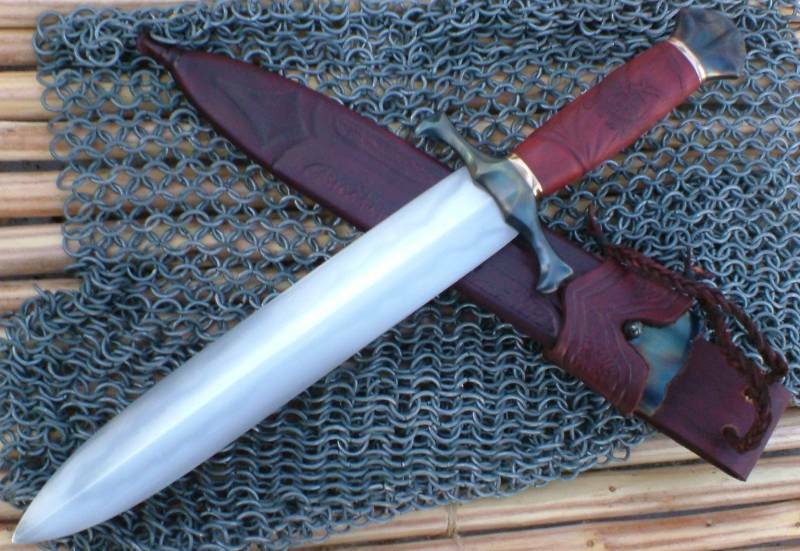 Forged 11" blade with clay temperlines.Forged and hot blued steel guard and pommel.Bronze spacers.Bloodwood handle is carved with a dragon. 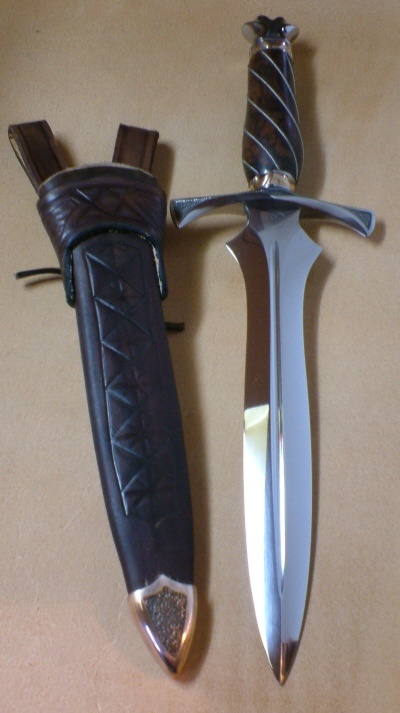 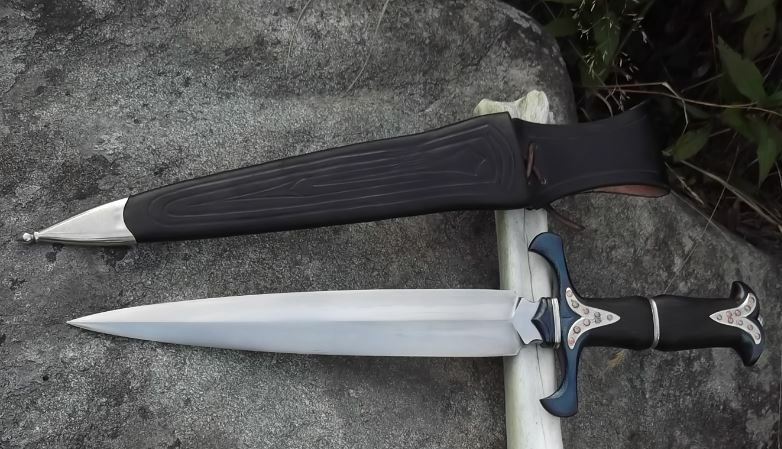 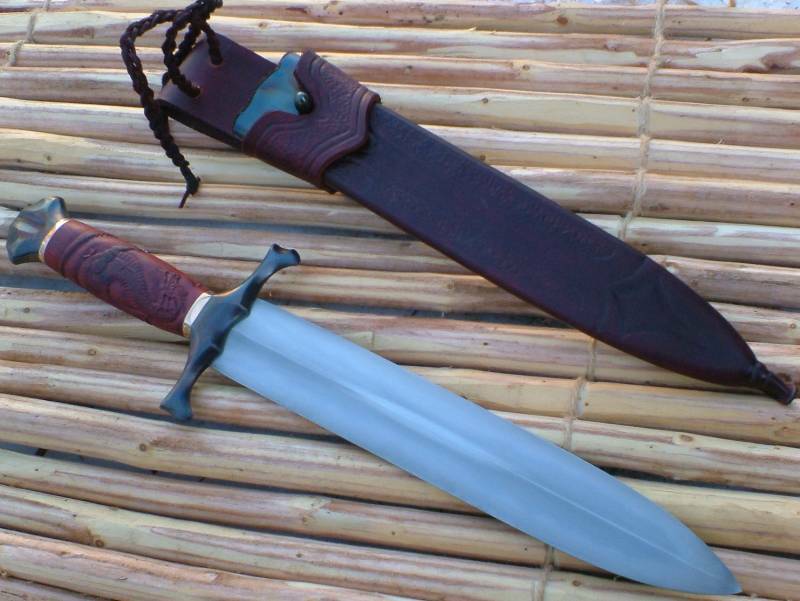 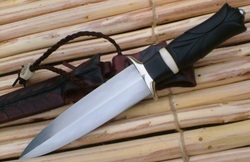 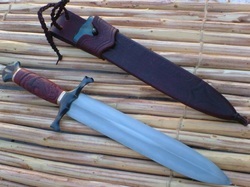 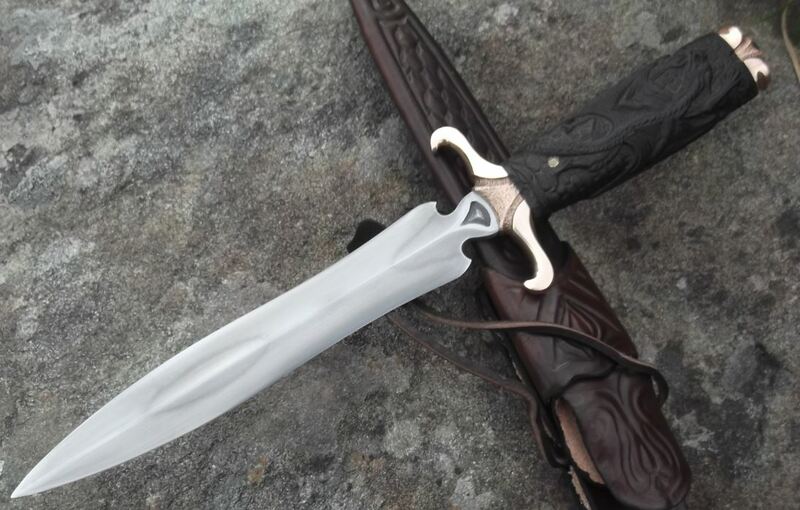 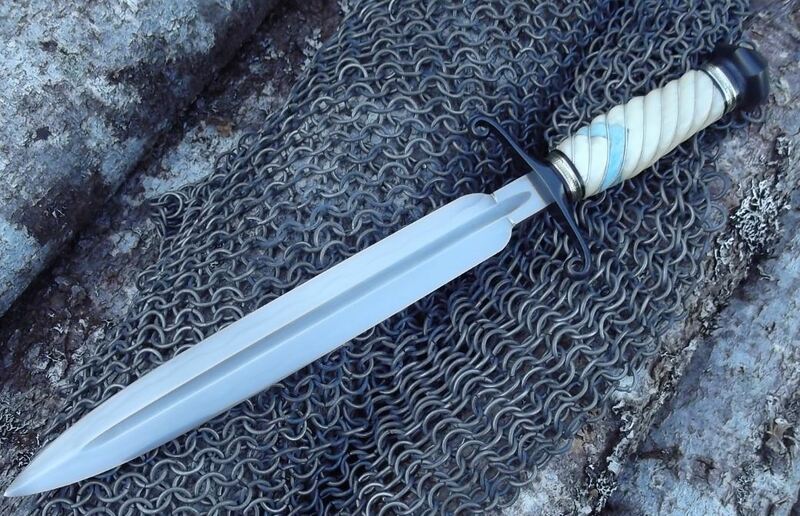 Forged 1095 blade with clay temperline / hamon.Carved and hot blued steel guard and pommel.German silver spacers and sheath fittings.Carved African Blackwood handle. 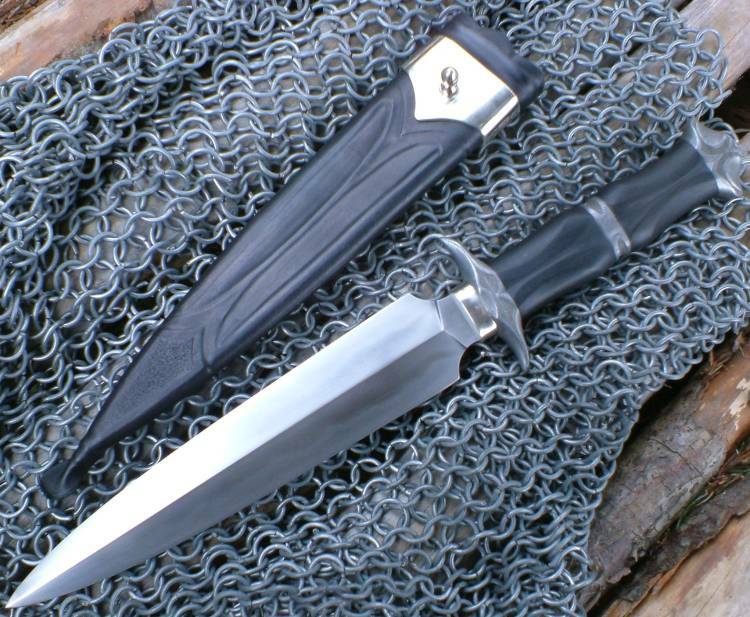 Forged carbon steel blade,highly polished.Fittings are German silver and stainless steel.Edwards black jade handle by Michael Hoover. 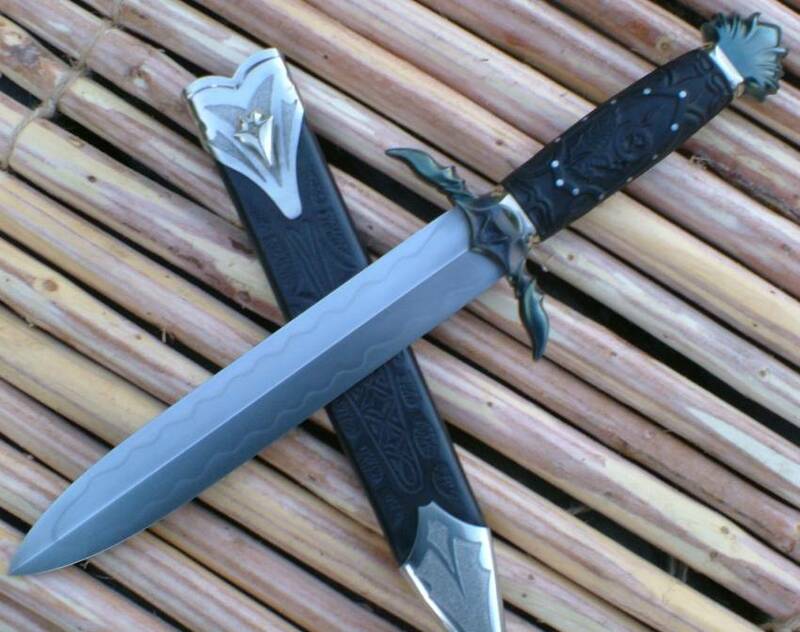 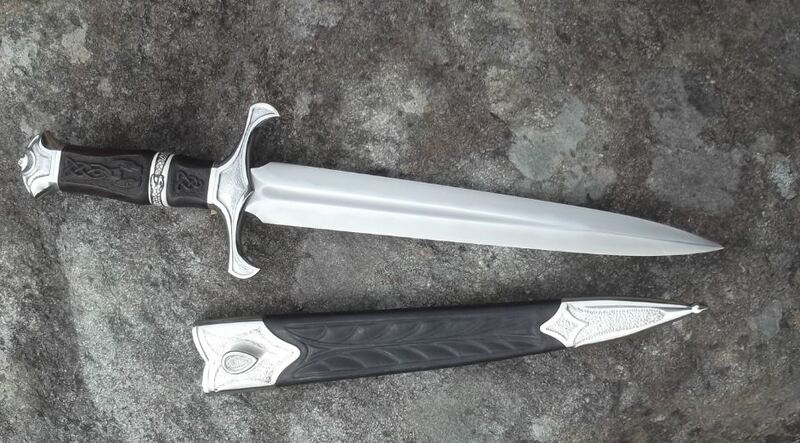 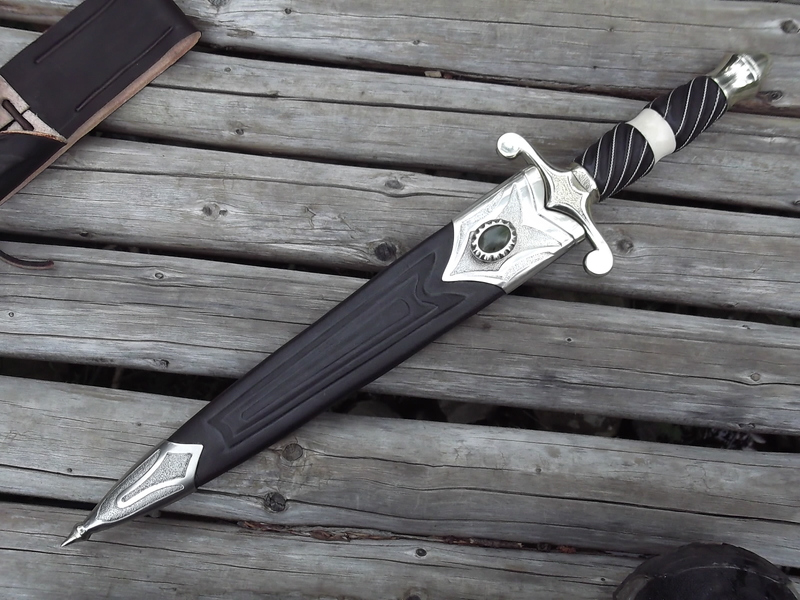 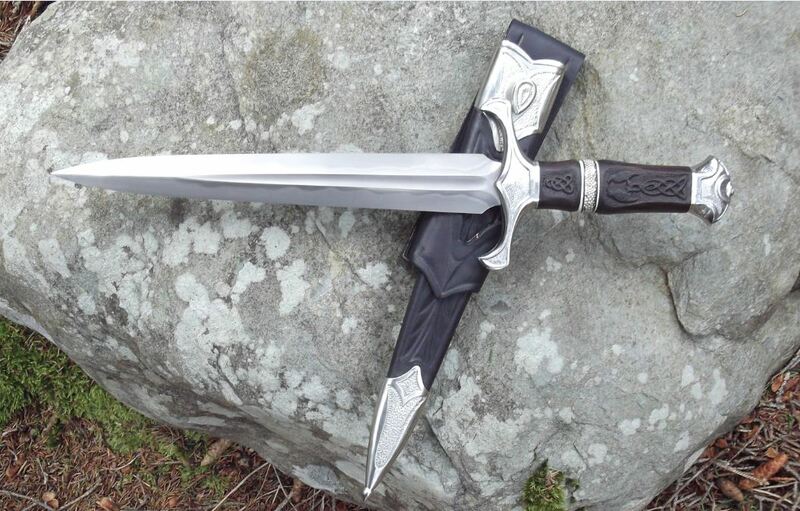 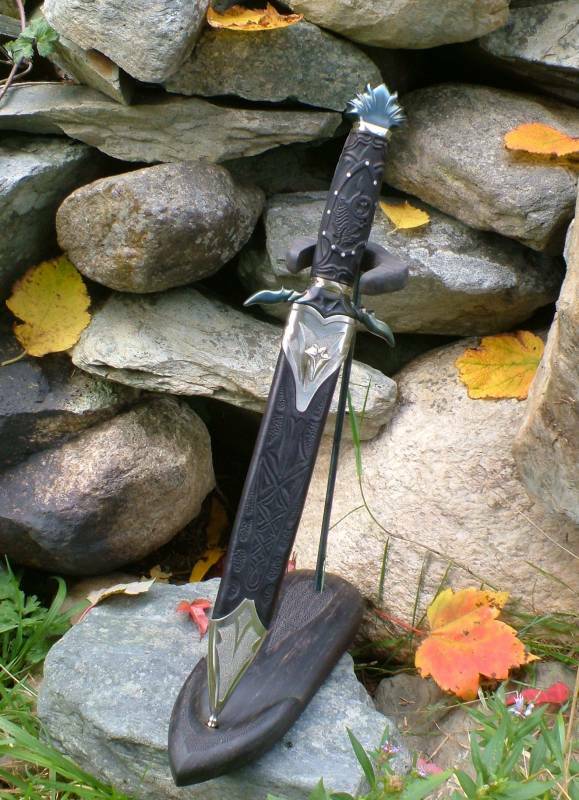 Forged 1095 blade with temperline.German silver fittings.Handle carved from ebony and bone. 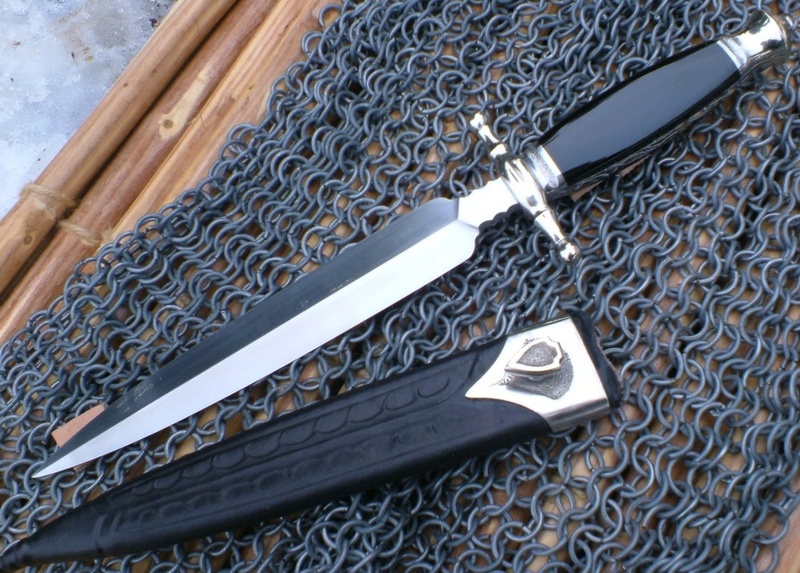 8 1/2" Forged carbon steel blade.German silver blade collar and sheath fitting.Guard and pommel forged from anchor wrought iron.Carved Ebony handle. 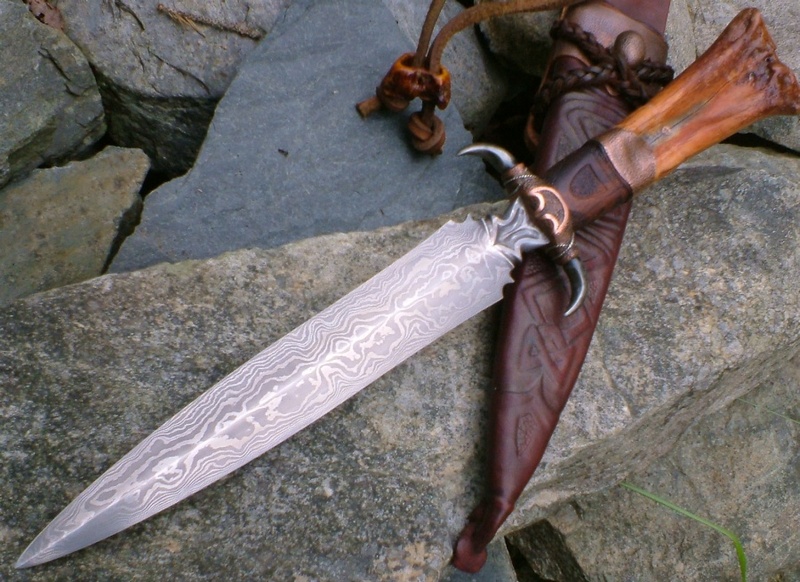 8 1/2" blade hand forged from my own pattern welded(damascus) steel.Blade has 80 layers of 1095 & 15N20.Copper guard with iron claws.Handle is desert ironwood,copper,and waterbuck bone. 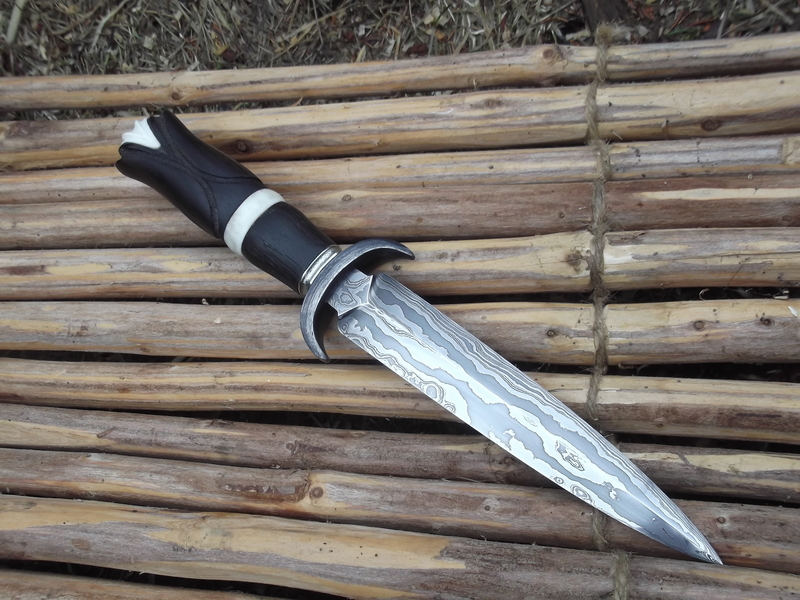 Blade forged from my own damascus.This one has a low layer twist pattern of 1084 & 15N20.Wrought iron guard and pommel.German silver spacers.Carved bone handle. 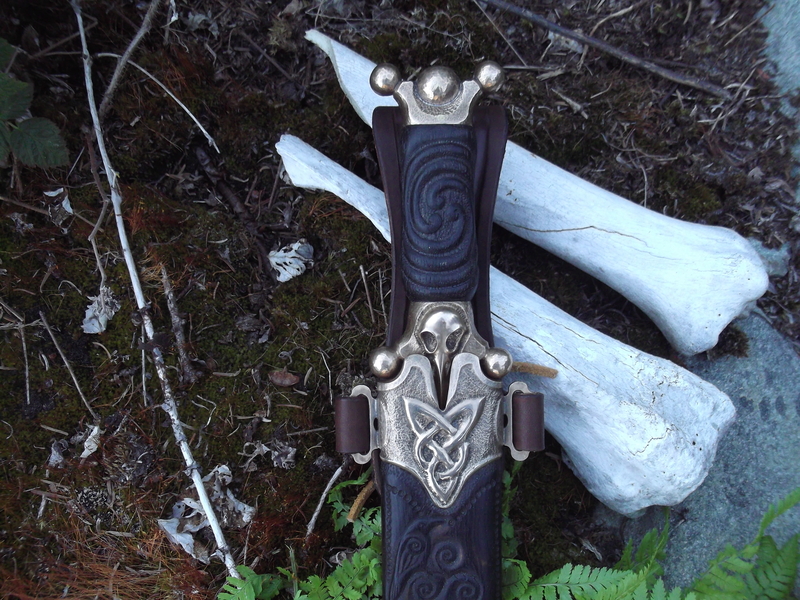 with stainless twist wire.Tooled leather sheath with bronze fitting. 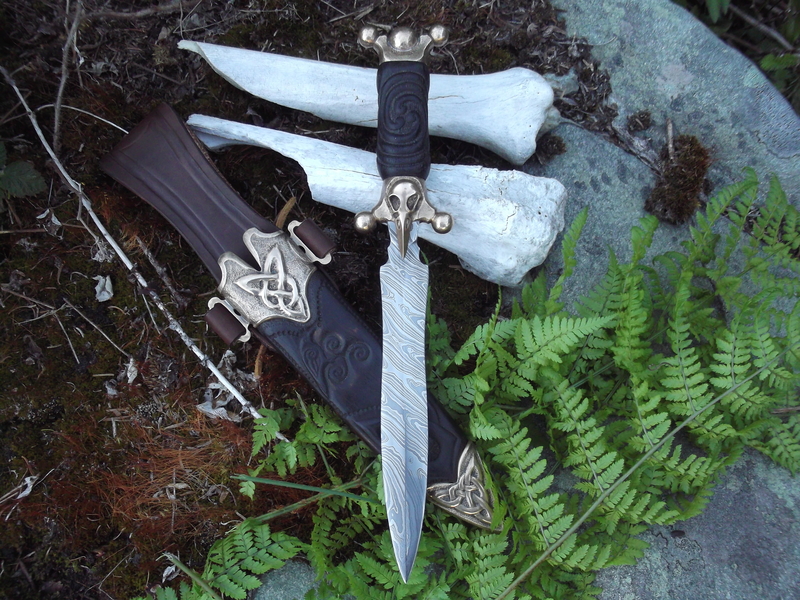 Knapped steel blade.Reindeer bone handle with leather wrap.Display stand of scorched oak,antler,bone and leather. 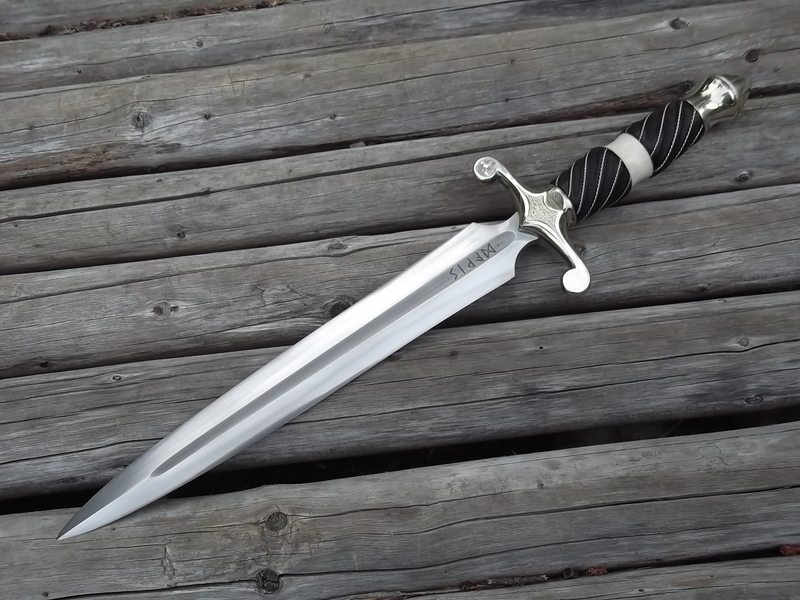 Forged 1075 blade with clay temperline /Hamon. 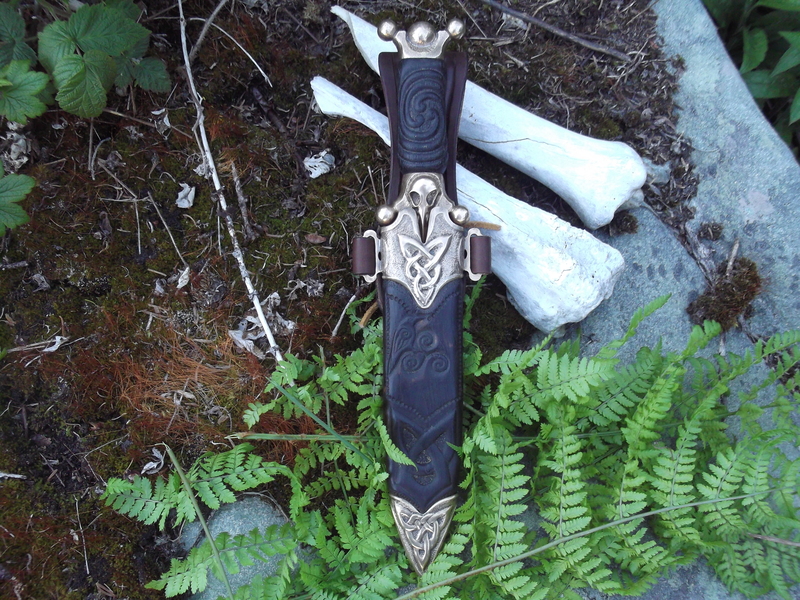 Carved Runes in the fuller.Nickel silver fittings.African Blackwood and bone handle.Included leather sheath with nickel silver fittings. 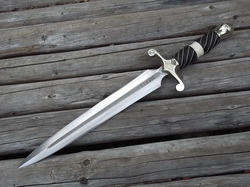 Forged 1075 blade with clay temperline. 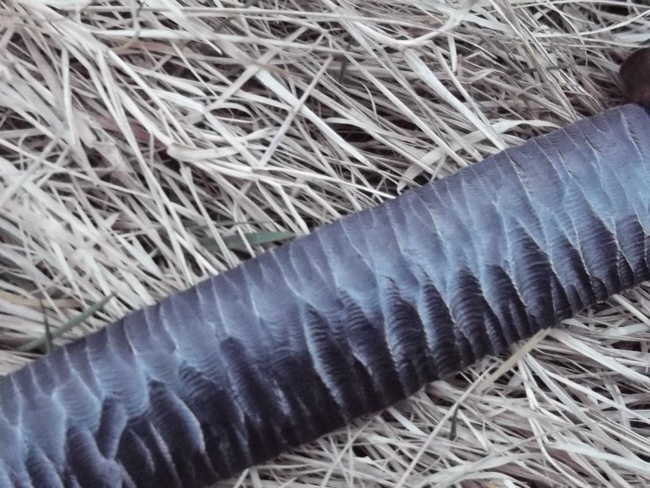 Hot blued steel fittings. 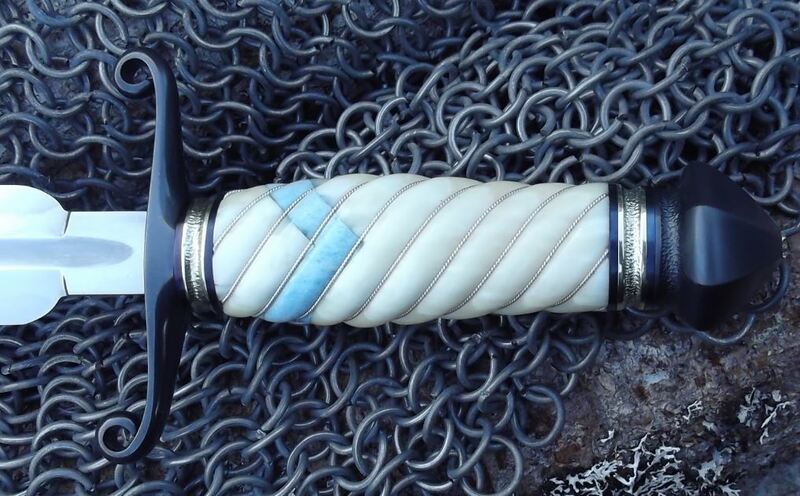 Octagon pommel.Nickel silver spacers and sheath fittings.Walrus Ivory handle with sterling silver wire. Forged 1075 blade.Fire blued steel fittings. 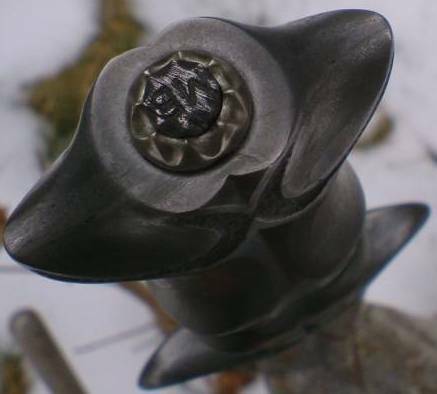 Nickel silver spacers and plates.Copper pins. 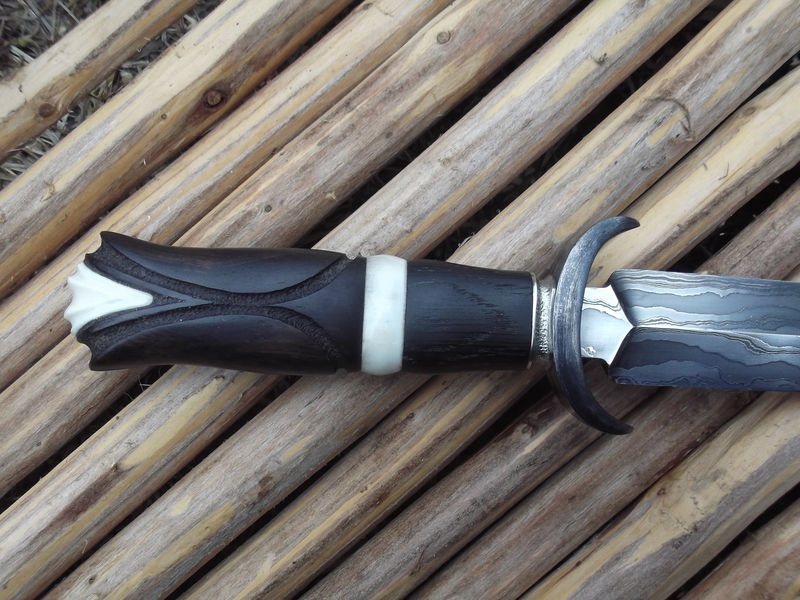 Handle of bog oak and blackwood. 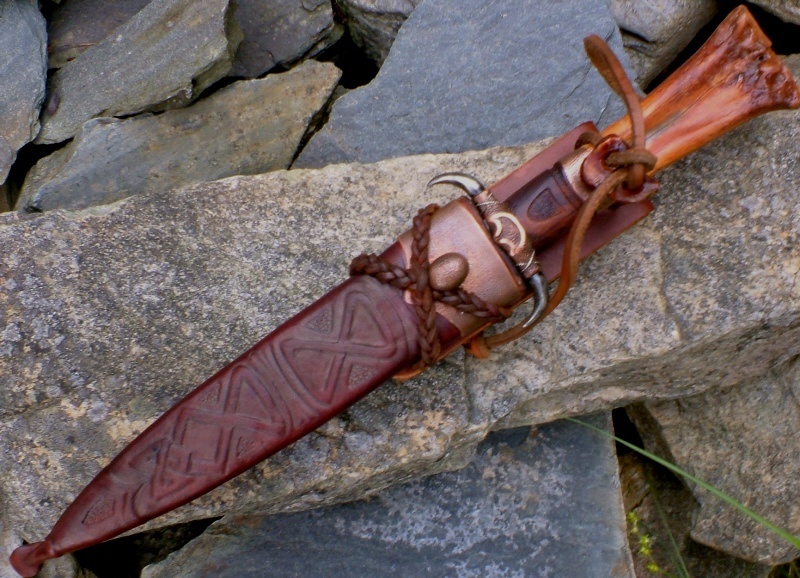 Ironwood,copper and waterbuck bone handle. 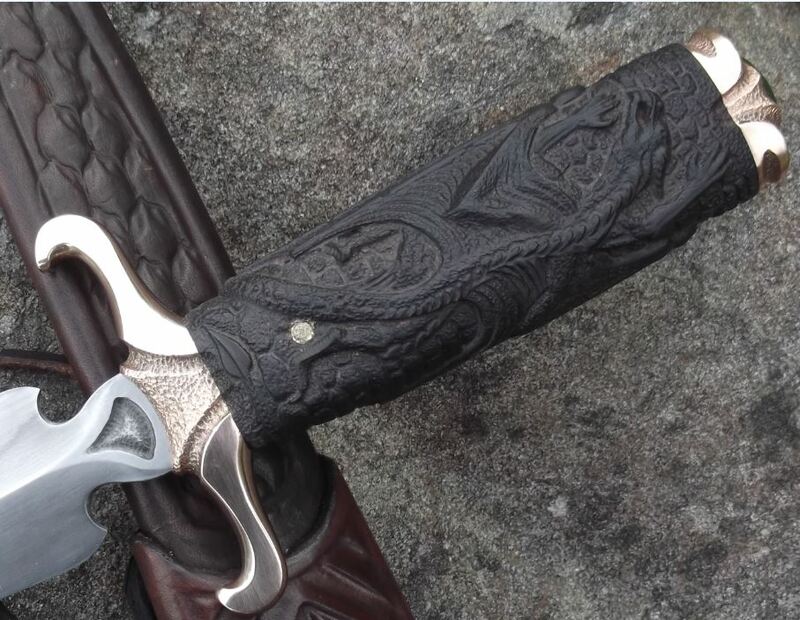 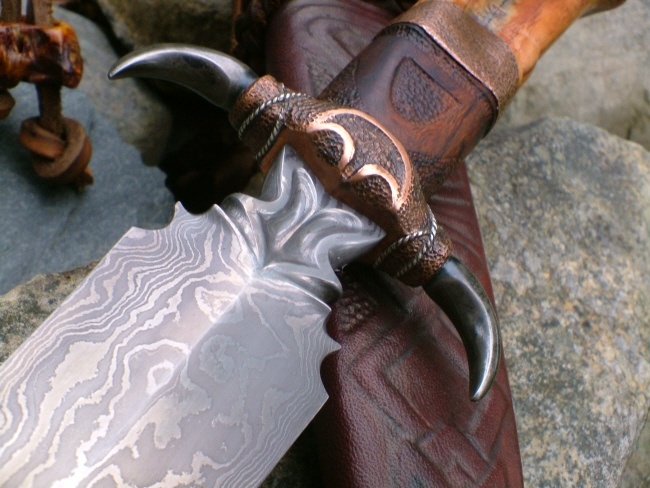 Damascus blade in a twist pattern of 1084 and 15N20. 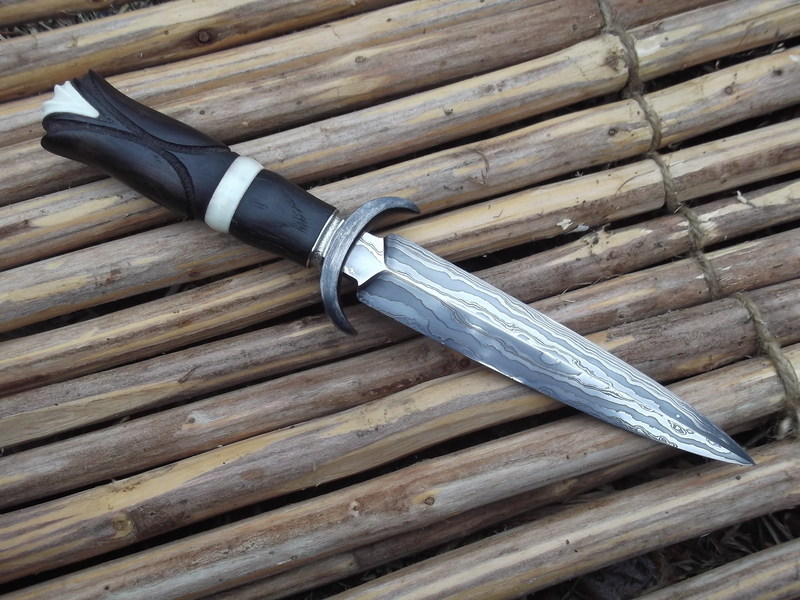 Bronze fittings,and Bog Oak handle. 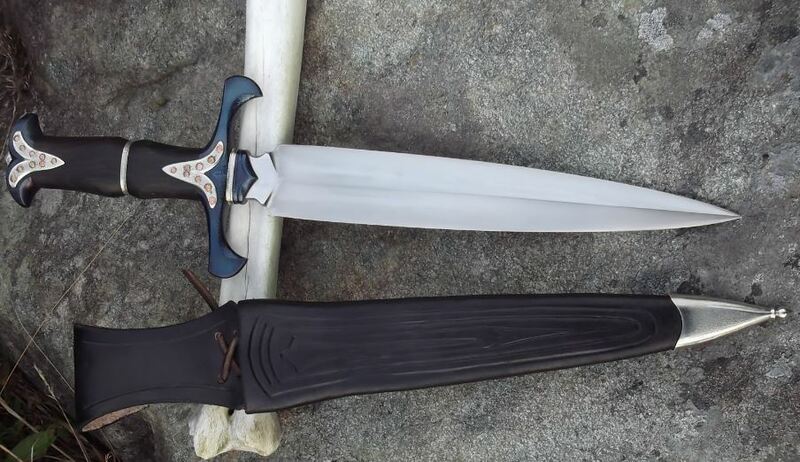 bone and blackwood.Wrought iron guard and nickel silver spacer.